LINCOLN’S GENERALS is a private, non-profit Living History Museum Partnership. All rights reserved. Reproduction in whole or in part without permission is prohibited. © 2013 Lincoln's Generals. LINCOLN’S GENERALS is a private, non-profit association. All rights reserved. Reproduction in whole or in part without permission is prohibited. © 2018 Lincoln's Generals. Logos, Images, Java Applets, scripts and individual pages are Copyright © 2013-2026 Lincoln's Generals, unless stated otherwise. The collection of information provided by the site is Copyright © 2013-2026 Lincoln's Generals. You may not copy or modify these images, scripts, java applets or html-pages without permission. "Normal" caching of content by web browsers and proxy servers is allowed, as long as the files are not being redistributed or modified". You may quote information from this website "limited to 500 characters per page" if a link to the source is provided as well. Please see the [Link Policy] to see how you are allowed to link to this site. You may not use extraction tools or tools to download parts of this website, or the entire website. You may not store pages permanently except for personal use. Learn by walking through the camp, viewing demonstrations, and engaging in conversation with HISTORIANS who are collectively engaged in investigating and interpreting the past as faithfully and accurately as possible. Let "LINCOLN'S GENERALS" dash you out of the passive "museum stroll" or a CD playing, come explore and discover the past with us. 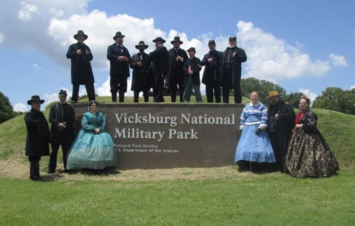 Commemorating the 155th Anniversary of the siege of Vicksburg in Vicksburg, Mississippi, July 3rd and 4th, 2018. "The Future of the History"